I'm always attracted to historical fiction that exposes me to new events and locations. 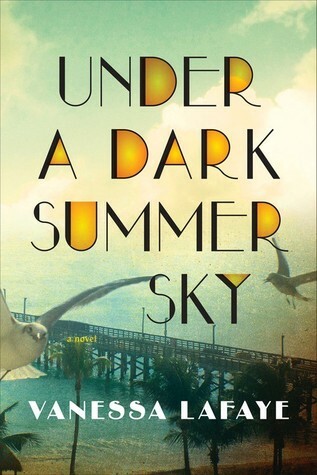 Under a Dark Summer Sky takes place in 1935 in The Florida Keys. The Great Depression is in full swing, but ultimately the residents in the Keys did not feel the brunt force of the Depression. Food was plentiful due to the ocean. Life certainly isn't easy in Heron Key - especially for its African American citizens - but it's better than life in the Northern cities and dust laden Midwest. The novel has several key players that drive the plot. At first, it was difficult for me to pinpoint the main character because all of the ones who drive the various chapters are pivotal, but I finally decided that in my mind Henry is the main character. Henry has a connection with each of the others. His presence makes an impact on the town and the relationships of other characters. It was slightly overwhelming in the beginning trying to keep each of the characters straight in my mind. There are so many moving pieces in this plot. I enjoyed that it combined the historical details with a crime mystery and a natural disaster. On top of all these intriguing elements, the town is also dealing with class conflicts and the bruises of segregation. A large number of soldiers is living in a camp on the edge of town while they work on a bridge project. These soldiers are looked down on by the townspeople because of their rude behavior and dirty appearance. The men are certainly a rough lot, but some of the soldiers were endearing and upstanding individuals. It was sad to see men who had fought in WWI being treated so badly by their fellow Americans. How easily we forget the cost of freedom. The racial conflict in this one was also heart breaking, but historically accurate. I felt like the weather in this one was a symbol for the racial tension throughout the novel. It continued to swirl and build until things were out of control. The response of the majority of the whites in town during the height of the hurricane was heart breaking and made me ashamed. This component of the novel was particularly difficult for me to read - especially in light of recent current events. Racism in 1935 or 2015 has no place. Aside from the social justice aspects, I was enthralled with the hurricane. Living in a landlocked portion of a coastal state, I have never experienced the brunt of the ocean's wrath. We occasionally get rain and wind as a result of hurricanes along the coast, but I cannot imagine living through the ferocious storm that rips through Heron Key in the novel. The scale of destruction and loss was sobering and heart breaking. I'm also inspired to do more research on other historical storms in US history. Under a Dark Summer Sky is a deeply atmospheric novel steeped in rich historical details, a violent mystery, and nature's wrath. It's an impressive debut for Lafaye that I recommend to fans of historical fiction. Grab a lemonade, find a comfy space, prepare your heart, watch the lightning flash, and get lost in Heron Key this summer. One Last Gripe: I was not as interested in the segments that took place at the soldiers' camp. I was more focused on what was going on with Missy, Hilda, and the weather. My Favorite Thing About This Book: Lafaye truly made this setting and people come to life with her beautiful writing. First Sentence: The humid air felt like water in the lungs, like drowning. Heron Key is already weighed down with secrets when a random act of violence and a rush to judgment viscerally tear the town apart. As the little island burns under the sun and the weight of past decisions, a devastating storm based on the third-strongest Atlantic Hurricane on record approaches, matching the anger of men with the full fury of the skies. Beautifully written and seductive, UNDER A DARK SUMMER SKY is at once a glorious love story, a fascinating slice of social history, and a mesmerizing account of what it's like to be in the eye of a hurricane. This sounds really good! Great review, going to add to my TBR! The symbolism in the story -- bad weather correlating with social strife -- is interesting. I'm adding it to my list.